Qemu on OpenSolaris running Solaris 9, OpenBSD, DragonflyBSD, FreeBSD and Linux. 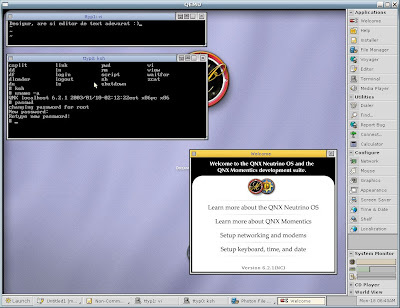 Solaris 9 running in qemu under OpenSolaris. - gcc, bison, gawc, flex, nawc, make, autoconf, perl, python, diffutils, bc, etc. - lynx2, ncftp, openssh, pine, wget, rsync, rcs, cvs, etc. MenuetOS, a rather interesting OS written in pure ASM.